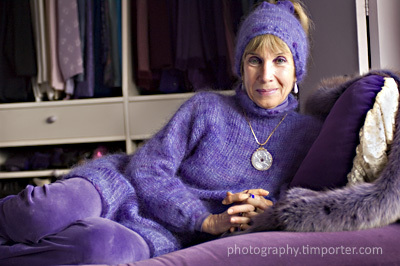 I’ve met countless hundreds of people in my many years of journalism and photography, but few possessed the uncomplicated goodness and sweet soulfulness of Barbara Meislin, the Tiburon writer and singer best known as the Purple Lady. Following the death of her young daughter, Meislin dedicated her life to bringing happiness to children. Her symbol was a rainbow; everything else in her life — clothes, cars, garden and home — was purple. Yesterday morning, the Purple Lady’s home, a large, airy structure astride a hillside above San Francisco Bay, burned. The flames took almost all she owned, leaving her — as is the cliche in these events — with little more than memories of the 43 years in which she made that home distinctly her own. 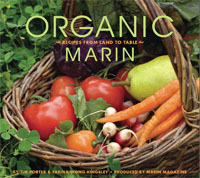 Barbara and I became friendly acquaintances and I would see her occasionally during my jaunts around Marin. She is a bright spirit and any encounter, like one a few weeks ago at Ruth Livingston’s gallery in downtown Tiburon, made me feel good. 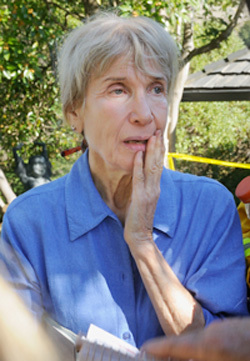 Standing in her driveway yesterday talking to neighbors, firefighters and a reporter, Barbara was a portrait of sadness. As much as she mouthed words of hope — “I’ll have to rebuild this house,” she told the Chronicle — her eyes, moist and red, spoke of the ache in her heart. She was dressed in blue. Clutching a box of tissues and an orange in one hand, Barbara talked distractedly, her thoughts spilling out as they occurred — how the fire started, why didn’t 911 answer, the narrowness of her escape and the fate of her many, many photographs. It was a familiar scene for many journalists, but not one I’d witnessed for many years. As a young photographer, and later reporter, I’d stood on many sidewalks outside burned homes or across from crashed cars and seen the very same face Barbara was wearing — drawn, vacant, a bit confused about how all that was good suddenly went so bad. Later, as I became an editor and traded in the streets of journalism for its desks, others went to the scenes and returned with the stories that, to the cynical — and, sadly, there is much cynicism in the news business — seemed cliched, tired and repetitive. I confess that, at times, I was one of those. I often tell people who ask what I do now that I’ve returned to my roots — writing and photography. But, in truth, the roots go deeper, extending into a belief that itself has become a cliche: That in everyone there is a story. That in the ordinariness of life, we find the extraordinary. That people are, for better or for worse, endlessly fascinating. As I drove away from Barbara’s house yesterday, the golden sweep of the Marin hills and the Golden Gate unfolding before me, I noticed I smelled like smoke. I thought again of this wonderful woman, standing tearfully in her driveway, grieving in public, and marveled at the privilege I have to share the lives of others. This entry was posted in On the Job and tagged Barbara Meislin, fire, Purple Lady, Tiburon.